Bilge & Locker paint is a single component high opacity satin topcoat that provides excellent durability. 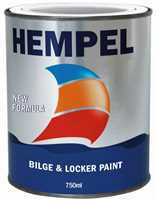 Good water and oil resistance for bilges and lockers. Not suitable for permanent immersion.